Prince Jake loves playing tricks on his big sister Princess Petunia and teasing his little brother Prince Ned – and generally getting into some right royal mischief! 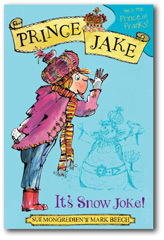 Jake was only having a bit of fun making a big fat snowman that looked like his dad, the king. Princess Petunia was so out of order, taking a photo of it and sending it to all the newspapers! 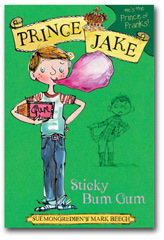 Now Jake’s in big trouble – and it’s all Petunia’s fault. How can Jake get the last laugh? Prince Jake’s really looking forward to the medieval fancy dress party – especially now that he’s sorted out his brilliant Black Knight costume. But then the king makes a stupid bet with Jake’s boastful Uncle Cosmo and the royal castle is under threat. 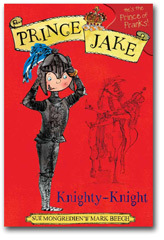 Can Black Knight Jake save the day? 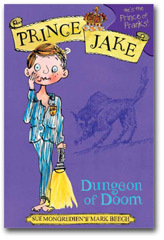 Prince Jake’s little brother has dared him to enter the creepy haunted dungeon at night time. 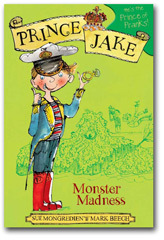 Jake’s a bit scared – but can’t lose face in front of Prince Ned. After all, there’s no such thing as ghosts – is there? It’s the Queen’s birthday – and Prince Jake is going to be in major trouble if he can’t think of a present quickly. Perhaps a monster surprise will be just the ticket! 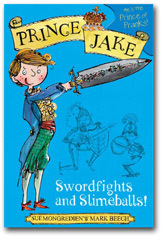 Prince Jake’s over the moon when he hears he’s going to learn sword-fighting – but less chuffed when he realises he won’t be able to use a real sword. Then he hears about the legendary Deathblade – a long-lost sword used by his ancestor. Wouldn’t it be cool if he could track it down?